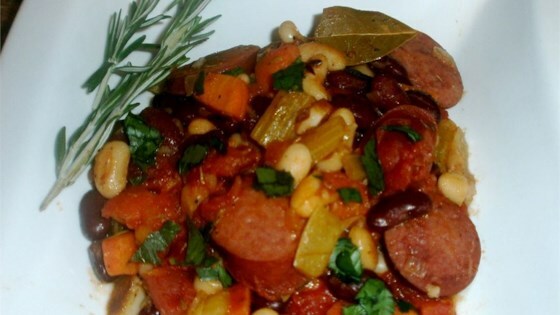 "A great combination of beans, smoked sausage and vegetables in an easy one skillet meal. We've been making this so long I can't even remember where I first got the recipe. It's a staple when we go camping. My teenage daughter and her friends love it. Serve with a green salad and French bread." Heat oil in a large skillet over medium-high heat. Add the carrots, celery, onion, and garlic; cook and stir for a few minutes, until the onion is transparent. Add the sausage to the skillet, and cook for a few more minutes to brown. Pour in the kidney beans, cannellini beans and tomatoes, and season with the bay leaves, thyme, salt and pepper. Cover, and reduce the heat to low. Simmer for 10 minutes, stirring occasionally until vegetables are tender. Remove bay leaves and discard. Sprinkle parsley over the top, and serve. As suggested, I did not drain my tomatoes and used Great Northern Beans since I had no canellini's on hand. Great, hearty recipe. When something seems too easy, it usually is. I made this based on the high reviews, but it was bland and had no flavor. Not very good at all.